If you can read this, please force a refresh of page files . Hit Ctrl-F5 or click twisted arrow icon. Home Example Strategies Using SectorSurfer Advanced Topics Theory Member Plans Referral Program F.A.Q. My Strategies Hall of Fame Screener My Calculator Account Information My Subscription Records F.A.Q. Diversify and Rebalance? Why Be Average? The financial industry has hypnotized us into believing diversification and rebalancing is the only worthy investment strategy. But diversification inherently means owning a little bit of everything — which is the formula for achieving precisely average performance! Rebalancing further ensures we won't stray far from average. No other industry proclaims average performance is the best you can achieve. Fortunately, it's not true here either. To achieve a different result requires a different approach. Price momentum has long been proven the best predictor of future returns. Simply by owning momentum leaders and avoiding momentum laggards one can simultaneously improve returns and reduce risk of loss. No diversification compromise! SectorSurfer further maximizes performance utilizing digital signal processing theory and automated strategy tuning. Before Retirement: The Nest Egg Value chart illustrates how an additional 10% annual return compounds over 15 years to produce a nest egg four times the value it would have otherwise had. The earlier you start, the greater the multiple. It really matters! After Retirement: The Nest Egg Annual Income chart illustrates how portfolio return affects the inflation-adjusted annual income you can take, assuming a $100k nest egg, 2.5% inflation, and 30 years of retirement to fund. In the illustrated example, investing in the S&P 500 would likely allow an income of $14,000/yr. However, earning an extra 10% increases it to $36,000/year. Again, it really matters! • The Economist: Momentum in Financial Markets. A compilation of industry studies and expert opinions. What is True Sector Rotation? Trends and fads are an inherent part of human character. It takes time for information to spread, to be understood, and to be acted on. This creates momentum. Price momentum is found in all capital markets, including stocks, bonds, treasuries, and currencies. By its very definition, "trend" means that information from the recent past tells you something about the near future. SectorSurfer's trend analysis algorithms use modern digital signal processing theory to optimally extract trend signals from noisy market data. The market cycle is tied to the economic cycle. Each market sector performs best during a portion of the economic cycle. If you think of each market sector as a piston in your investment engine, the smoothest, most powerful ride will be achieved when each of the major market sectors is represented in your portfolio ... but only while each is delivering its power stroke. By owning only the top trend leaders and avoiding trend laggards one can simultaneously improve returns and reduce risk of loss. That's True Sector Rotation! Diversification inherently yields precisely average performance. Master investor Warren Buffet instructs us: "Wide diversification is only required when investors do not understand what they are doing. • Short video demo on how True Sector Rotation produces higher returns. • Sector Rotation Theory Page provides theory summary and technical explanations. • The Economist: Momentum in Financial Markets. A must read for momentum doubters. 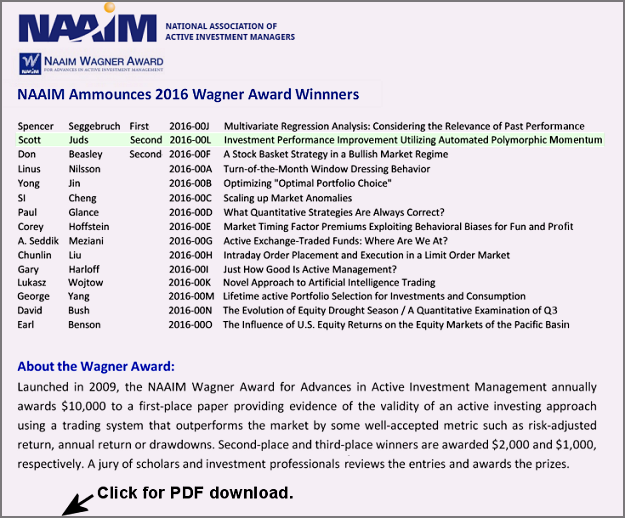 • Jegadeesh & Titman Profitability of Momentum Strategies. 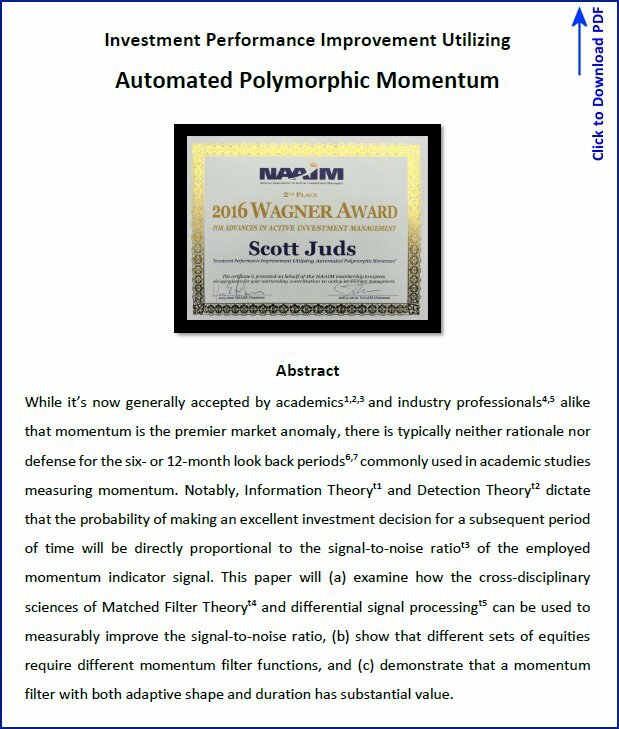 Academic momentum paper. Risk is About Losing Money! The definition of risk depends on who you ask. The financial industry uses the coefficient of variation (CV) to measure risk, which tells you how wiggly the line on the chart is, but not the probability of losing real money. Treating both up and down-moves equally as risk is an unfortunate consequence. Only down-moves contribute to real loss. 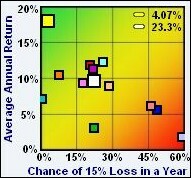 SectorSurfer's risk measure is the probability of a 15% loss in a year. Not only do SectorSurfer's trend-following algorithms inherently steer around and avoid poorly performing funds, but its StormGuard Indicator monitors overall market health and advises a move to the safety of a money market fund when market storms approach. The StormGuard Indicator is calculated daily from a basket of broad market indicators. The StormGuard Indicator optimally tunes itself for the minimum probability of loss according to the character of the constituent funds/stocks of each SectorSurfer Strategy by balancing the probability of whipsaw loss from reacting too quickly to market dips against the probability of loss from reacting too slowly to major downturns. Warren Buffet instructs: "Risk can be greatly reduced by concentrating on only a few holdings." SectorSurfer practices serial diversification by owning many very different things, just one at a time. • Short video demo about how SectorSurfer makes lower risk possible. • StormGuard Technical Details in the SectorSurfer Online User Manual. 1. View the short My Strategies Tour video. 2. Click , pick a Strategy, or create your own. 3. Check charted performance by clicking . 4. Edit the name and add notes. You're done! 1. See which ticker symbols to sell and buy. 2. Click the icon for specific trade information. 3. Click your brokerage link and go make the trade. 4. Click the button. You're done! • Short video demo showing how to select or custom build Strategies. • SectorSurfer Online User Manual details all the features and functions. • Subscription Plans range from Free to just a monthly pittance for Premium Strategies. • Our will help you quickly create an account to get you SectorSurfing. SectorSurfer's validation is confirmed by the validation of each principle detailed in the paragraphs below. In his 1996 book Chaos and Order in the Capital Markets, Edgar Peters applied the Hurst Range/Scale analysis method to data from all capital markets, including stocks, bonds, commodities, and treasuries. He found that they all have a significant short-term trend component that dissipates after numerous months. • See Hurst Exponent Reveals Trends on the Sector Rotation Theory Page for further technical information. 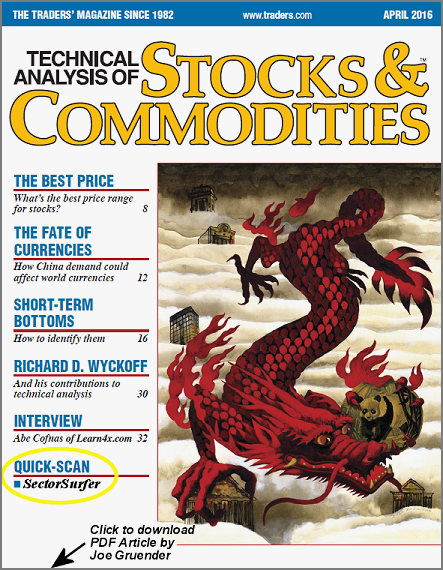 • The Economist: Momentum in Financial Markets. A survey of strategy results and expert commentary. • Columbine Capital Price Momentum - a Twenty Year Research Effort. Industry momentum white paper. • Jegadeesh & Titman Profitability of Momentum Strategies. A fundamental academic momentum paper. How can we tell that the trend signal we extract from the noisy market data really does drive SectorSurfer's performance? The Hurst exponent measures the quality of the trend signal and has a month-end bump in its character. This bump is a fingerprint likewise found in the character of SectorSurfer Strategy performance. • See SectorSurfer's Trend Fingerprint on the Sector Rotation Theory Page for further technical information. Stationarity refers to the character of a random process remaining the same, such as the distribution in heights of men, shoe sizes for women, or trend lengths in market data. Stationarity enables one to confidently manufacture shoes of various sizes even though the shoe size of the next customer is unknown. Backtesting provides assessment of market character. Stationarity in market character enables strategy design to learn from the past in order to improve one's batting average for future investment choices. • See Trend Signal Stationarity on the Sector Rotation Theory Page for further technical information. "Diversify and Rebalance" was born with MPT (Modern Portfolio Theory) in 1950 when we had rotary dial telephones. Today the telecom industry has wireless digital cell phones with touch screens, video cameras, voice dialing, and GPS maps. But, the financial industry is still selling us 1950s diversify and rebalance? One of the most fundamental methods for improving the signal-to-noise ratio in data communications is to eliminate common mode noise via differential signal processing. That's why it's built into Ethernet and USB. Most charting and analysis software evaluates ticker symbols independently, which taints the analysis with common mode market noise resulting in excess whipsaw losses reacting to noise unrelated to its own relative performance. SectorSurfer's simultaneous differential analysis eliminates common mode noise. Matched filter theory provides the basis by which trend signals can be optimally extracted from noisy market data. The well-known academic paper Profitability of Momentum Strategies, by Jegadeesh & Titman used a simple equally weighted SMA (Simple Moving Average) of length 6 months as its trend measure. However, neither the SMA nor 6 months are near optimum compared to the Matched Filter Theory solution. Simply put: better trend analysis produce better results. See this summary comparison and the Strategy Hall of Fame. Investors familiar with technical chart indicators know how tedious it is to determine which indicators and what parameters to use. SectorSurfer completely automates this process for you. Better results, less time! SectorSurfer levels the playing field with Wall Street by putting the power of award winning high performance investment algorithms in your hands. 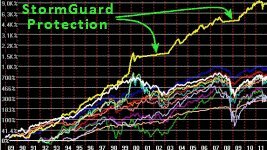 Its True Sector Rotation algorithm holds only the momentum leader during bull markets, and its StormGuard algorithm protects and grows your assets during bear markets. Only by owning the trend leader and avoiding the trend laggards can you simultaneously improve returns and reduce risk. higher returns as shown by example below. White dot: S&P500. Yellow dot: SectorSurfer. as shown in the example chart below. True Sector Rotation is the method of owning the one, and only one, best trending fund at any time. Since half of the market sectors will, by definition, be beating the S&P 500 at any time, owning only the trend leader is an excellent way to beat the market. Market data contains trends, and a trend means that something from the past can tell you something about the future. Thus, extracting trend signals from noisy market data is the whole game. SectorSurfer extracts trends from noisy market date to improve your investment batting average. It works for ETFs, mutual funds and stocks. Market storms are much larger than market corrections and require special detection methods. SectorSurfer's StormGuard algorithm is designed to find the optimum balance between reacting too quickly and producing whipsaw losses, versus reacting too slowly and getting hurt by the market storm. StormGuard-Armor is our highest performance market sentiment indicator. It examines three separate sources of market data to derive whether the market is safe for investing. By focusing on Safety First, not only are losses reduced, but you keep more of your hard earned returns. StormGuard-Armor is in fact the highest performance market direction indicator on the market! Click for more information. SectorSurfer's US Gov. Thrift Savings Plan Strategy achieves the performance depicted by the yellow equity curve on the chart below simply by determining which of the TSP funds has momentum leadership and owning only that fund for the next month. SectorSurfer completely automates the process of selecting the best fund to own — emotional bias is gone! Strategies are evaluated daily and an email/text Trade Alert is sent typically about 2.2 times per year when momentum leadership changes. Compare its performance against any other TSP strategy service and you'll know why our $10/month subscription fee is a bargain. Click each of the sliders above for a more complete description of how and why SectorSurfer works so well. To add this to your My Strategies list, click the icon to open the Select-a-Strategy popup window and select TSP Thrift Savings Plan from the list. This high performance Strategy was designed to utilize the True Sector Rotation algorithm during bull markets to select and own the best trending of the various stock funds (TSP C-Fund, S-Fund, I-Fund, and various Lifecycle Funds), and use the StormGuard-Armor algorithm to signal a retreat to the fixed income fund TSP-F when a dangerous bear market threatens. 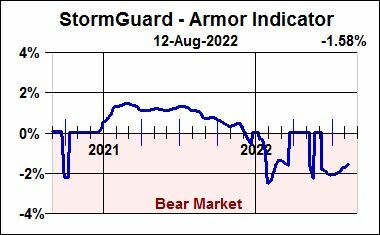 StormGuard-Armor is the market's preeminent high performance indicator for determining market direction. The TSP-G and TSP-F funds are not mixed with the True Sector Rotation candidate funds because their presence in the selection process actually reduces the decision quality and results in somewhat lower returns and higher risk for technical reasons explained HERE. The Thrift Savings Plan offers a set of 10 funds providing exposure to large cap (TSP C-Fund), small cap (TSP S-Fund), fixed income (TSP F-Fund), government securities (TSP G-Fund), international stocks (TSP I-Fund), and five Lifecycle funds (TSP L-Funds). By law, most of these funds must be invested in a portfolio designed to replicate a specific market index. Unfortunately there are no public ticker symbols for the TSP funds and there is no web-published historical data available for any of them suitable for use with services such as SectorSurfer. Fortunately, the market indices associated with the TSP funds do have ticker symbols and do have available historic market data. SectorSurfer utilizes the historic market data for these indices as proxy data for each of the TSP funds as detailed in the table below. character is sufficiently similar to adequately perform their intended functions for SectorSurfer's asset class rotation algorithms. 1. Click the Signup Wizard button on the right to create your account. It costs nothing to open an account and experiment with custom strategies or make use our totally Free Strategies. See Member Plans Page for details about Free and Premium Memberships. a) On the Create an Account screen specify your username, password, full name, and email address. - Section A: Optionally add a backup email address or cell text number for your Trade Alerts. Click the button. - Section A: Optionally enter your Referrer's name to give them credit. Review the Referral-Name you'll give others. - Section B: Review the subscription options and click checkbox to acknowledge having read it. - Section C: Optionally order a subscription (required to receive Trade Alerts for this Strategy). Acknowledge the checkbox. You're Now Are a SectorSurfer! 2. The My Strategies Page will automatically be your next destination. This is your definition list of personal Strategies. a) Please watch the short video demo. It will save you time and frustration. Click its icon in the upper left of the page. b) Note the other help resources in the upper left and bottom of the page. c) Experiment with the Example Strategies provided. Mouse-over the icons and ticker symbols. Click things to see what they do. - Click the icon in the 2nd row to get the Select a Strategy popup screen. - Scroll down until you see the Strategy name matching the above Strategy, then click its line to highlight it. - Then click the button near the bottom to import this Strategy into your personal list. • Typically just 3 to 5 Trade Alerts per year. • SectorSurfer signals - you make the trade. try your ideas with your own custom design. • Its as easy or complex as you'd like it to be. ... While You go Have a Life! • Ready? It Costs Nothing to Start - Let's Get Surfing! "This product stands like an oak tree amid a forest of saplings. Over the years I have examined dozens of investment advisory services, but this one is the best by far. As a retired USAF officer, of particular importance is their popular TSP Thrift Savings Plan strategy designed for military/federal employees. I've been an enthusiastic SectorSurfer since January 2011." "I can tell you with certainty that SectorSurfer stands in a class of its own as the premier investment tool for individual investors. Its high performance algorithms literally level the playing field for individual investors against the big traders on Wall Street and will provide you with the confidence and to wisely manage your own investments." Former Program Director of the LA AAII Chapter. "It is very satisfying to see my returns beating the market averages month after month. It even made my wife's restrictive and excessively diversified government retirement account perform well. This investment tool tops my list!" "I finally pulled the trigger on the SectorSurfer Fidelity KickAss Strategy. Since then the market has not been as hot AND yet I notice that the fund recommended by Sector Surfer is doing very well. My GAUD this is really going to work! What was once only an academic understanding of your methods has sunk in. Thank you for doing the hard work. "The effort/time you have put into your web site has produced outstanding results. I spend a lot of time on finances, and your web site is the finest I have ever seen. I am an ex-fighter pilot, land developer, and a full-time trader for the last 10 years." "With SectorSurfer's algorithms doing all the work, I get much better results and have more time in the day for real life. I used to spend hours each day sorting through funds looking for winners. " "I had no idea which funds to own until I found SectorSurfer. Now I know what to do and when to do it. Most importantly, I know SectorSurfer will look out for me when I'm busy taking care of business." "I used to be literally afraid to look at my retirement account, but Sector Surfer thankfully keeps track of it for me now and always keeps me in the best funds. It really is amazing and gives great peace of mind!" versions include Best Federal Thrift Savings Plan Strategy, Best Military Thrift Savings Plan Strategy, Best Governmnet Thrift Savings Plan Strategy , Best US Gov. TSP Strategy. SumGrowth Strategies, are all trademarks of SumGrowth Strategies, LLC. Seattle WA 98125. Copyright 2010-2016 SumGrowth Strategies, LLC. All Rights Reserved. trading at the market close of trade dates, and does not include associated trading fees or account fees. SectorSurfer is limited to personal use only. Please Read More Here.